This is the third in our series of guest blogs by Fatimah Araneta. The third layer was bestowed by the Spanish colonizers. 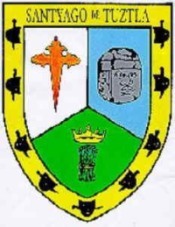 Some places received the names of cities in Spain, such as León (in the state of Guanajuato) or Córdoba (in the state of Veracruz). Sometimes the original Nahuatl was maintained but mispronounced so much that the name became corrupted, as in Churubusco, which used to be called Huitzilopochco. Some other times the name of a saint was added to the place name, as in Santiago Tuxtla, Santa Teresa Tiloxtoc or San Miguel Chapultepec. The choice of the saintly counterpart to an already existing place name was hardly ever a frivolous decision. The different religious orders who set out to convert the indigenous populations to Christianity had their preferences. The Franciscans, for example, relied on Saint Michael to be their champion in the battle against the devils of the New World. Luckily for the evangelizing friars, Saint Michael also happened to possess attributes that made it easy for this religious icon to be accepted by the potential converts. In the Old World, apparitions of Saint Michael had first taken place on mountaintops (high places near heaven from which he had banished Lucifer) and caves (since he was also in charge of assisting departing souls into the netherworld). Later, he would become involved in miraculous apparitions of springs of water, as in Mont Saint Michel in northern France, and was henceforth increasingly associated with the agricultural cycles of sowing and harvest. At the same time, a very important figure in the prehispanic pantheon was Tláloc, the rain god, venerated too on mountaintops and at the entrances of caves, since it was believed that mountains were the containers of the weather. It was to Tláloc that one turned to ask for abundant rain for the crops, as well as mercy from the snakes of fire, or lightning bolts, that could inflict so much damage. Images of Tláloc depict him holding a bolt of lightning in one hand, not very differently from how images of Saint Michael show him wielding a flaming sword. Thus, with this third layer of meaning, a place name in Mexico gives many clues to the past. If “San Miguel” is part of the name it could be telling us that Franciscan friars had been in charge of the place at one time; that there could have been a cult to Tláloc; that the place was and could still be of hydrological importance; and that it could have been and could still be the focus of religious pilgrimages related to agricultural cycles. The next part will consider how some Mexican places were rechristened during Mexico’s independent era (post 1821). This is the second in our series of guest blogs by Fatimah Araneta. In the first part, we looked at the possible origins of Chicnautécatl or Xinantécatl, aka El Nevado de Toluca, Mexico’s fourth highest peak. In this part we start to consider Miguel León-Portilla’s view that a single place name in Mexico can have up to four distinct levels of meaning. The first layer of meaning is more often than not a geographical description of the place in the language of its original inhabitants. Two examples in Oaxaca are Yodzo Coo, which in Mixtec means “Plain of the Snakes”, and Yacu Dzaa, Mixtec for “Hill of the Bird”. The second layer is generally in Nahuatl, as the expansion of the Aztec empire made this language the lingua franca over an extensive territory over the course of several centuries. The Nahuatl name would almost always be a translation of the first place name. 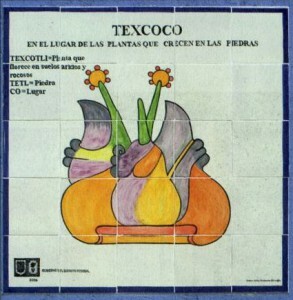 For example, the above mentioned Yodzo Coo was renamed Coixtlahuaca. On other occasions, the Nahuatl name would be another geographic appreciation of the place, but this time from the viewpoint of the Aztecs. For example, the region occupied by the Purépecha nation was called Mechuaca, which is Nahuatl for “Place of Fish”. That region is roughly what today is the modern state of Michoacán. The Purépecha simply called their territory P’urhépecheo, “Place Where the P’urhé Live”, p’urhé meaning people, referring to themselves. The next part in this mini-series will look at how a third layer was often bestowed on Mexico’s placenames by the Spanish colonizers who arrived in the early 16th century. We are delighted to publish a series of guest blogs by independent researcher Fatimah Araneta. Mexico’s fourth highest peak is an extinct volcano that rises elegantly above the city of Toluca. 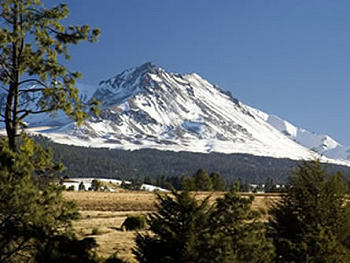 It is generally referred to as “el Nevado”, which is short for “el Volcán Nevado de Toluca”, Toluca’s Snow-Covered Volcano. Nowadays, however, the name is sadly inaccurate since the volcano is hardly ever covered in snow. 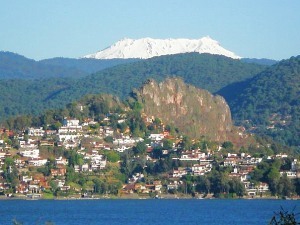 El Nevado is also known as Xinantécatl. 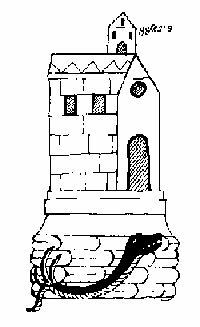 This name first appeared in an official registry in the second half of the nineteenth century. It sounds like Nahuatl, the language of the Aztecs, but historians have debated at length about its origin and meaning, questioning its authenticity. The closest place name that bears any etymological resemblance is the town of Zinacantepec, “Hill Where There Are Bats”. However, the volcano does not possess a significant bat population, and Zinacantepec is only one of dozens of small towns that surround it. It is possible that the original name in Nahuatl had really been Chicnautécatl, “Nine Peaks”. This would dovetail nicely with the Lerma River’s old Nahuatl name of Chicnahuapan, “Nine Rivers”. The River Lerma is the result of the confluence of several streams that spring from the sides of the volcano. An explanation offered by García Martínez of how “Chicnautécatl” could have become “Xinantécatl” is a not-so-farfetched series of errors, considering the lack of a basic alphabet in Nahuatl. It could all boil down to how the name was pronounced by one person, written down by a second, and later read and copied, or rather miscopied, by a third. 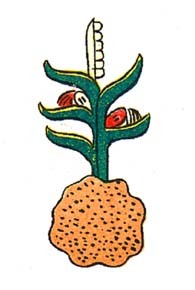 The number nine in nahuatl is “chicnaui” and that is how it is generally written now, but it can be pronounced “shicnaui” as well as “chicnaui”. It is possible that one person informed a second that the volcano was called “Chicnautécatl”, pronouncing it with a “sh” sound, and the one who listened wrote an “X” for the beginning “sh” sound (the Castilian alphabet has no letter for the “sh” sound). So, it may have been registered as “Xinautécatl”. Then, according to this line of thought, a third person misread the name, mistaking the “u” for an “n”, or miscopied it, writing an “n” instead of the “u”, thus giving rise to “Xinantécatl”. However it may have been, the volcano is still more often referred to as “el Nevado”. Fortunately, the origins of most place names in Mexico are more straightforward and comprehensible. The next part of this article examines why many Mexican place names have up to four distinct layers of meaning. In Mexican Spanish, the “x” can be pronounced “s” as in sun, “sh” as in shoe, “h” as in hat, or “x” as in taxi. In the case of “Xinantécatl” it is pronounced “s”. 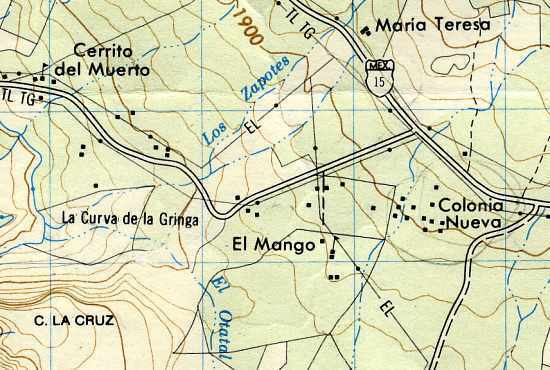 Another interesting example of an unusual place name (following on from an earlier post about unusual place names) is the name “La Curva de la Gringa”, the American woman’s curve. La Curva de la Gringa is the name of a 90-degree bend near Jungapeo, west of Zitácuaro in the state of Michoacán. Literally translated as “the American woman’s curve”, how did this name come about? The first thing to remember is that all names on maps have to come from somewhere. Detailed maps of Mexico, including the 1:50,000 series, rely initially on aerial or satellite imagery, followed by some checking on the ground. Given the expense, ground checking is often relatively limited. However, the on-the-ground surveyors are responsible for adding names to the maps. In this case, local informants were apparently unanimous in calling this bend La Curva de la Gringa. Further research shows that this had nothing to do with any purported similarity to the sensuous curve of a gringa‘s breast, but derived from when the road was first paved in the 1950s. Apparently, shortly after the road was finished, an American lady driving her oversized gas-guzzler down to the luxury spa of San José Purua completely missed this bend, and plowed into a cornfield. The locals have long memories! In 2010, this road is being widened, and sidewalks and street lights installed, all the way from Federal Highway 15 (see map), past La Curva de la Gringa, and as far as the money allocated (currently about 7 million pesos) allows. The first section was due to be inaugurated 21 March 2010. If anyone has an update, please leave a comment. Here’s hoping that no more accidents ever occur along this stretch of road, and that no future place names ever reflect such unfortunate incidents. In earlier posts, we’ve taken a quick look at typical Spanish-language place names (toponyms) and also some common indigenous place name elements. But what about those place names that do not match any of the expected categories? 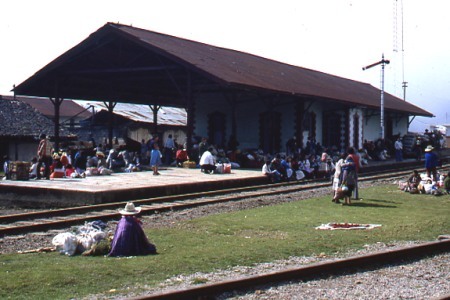 My personal favorites in this category include the railway stations of Honey in the state of Puebla (named for a famous railroad engineer) and Wadley in the state of San Luis Potosí. The latter is particularly strange since the letter w does not belong to the Spanish alphabet. 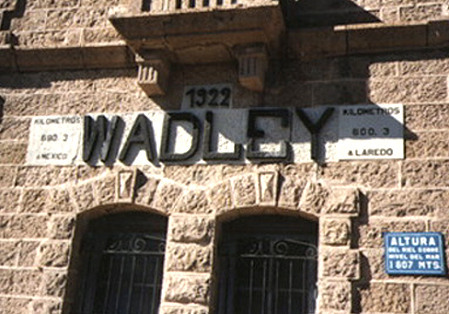 I’ve never been able to identify the origin of the name Wadley with any certainty, but for one possible explanation, see Mexico has many “Est”raordinary railway places. Another example of an unusual name is that given to one of the sharpest curves on the Mexico City to Cuernavaca highway — La Curva de la Pera, which means “The Curve of the Pear”. The derivation of this name for a bend in the road that loops back on itself is fairly self-evident. Here’s hoping that your vacation after navigating past this bend does not end up being similarly “pear-shaped”! Many similar instances of how names were allocated, and examples where place names proved critical to legal issues, are given in Raymond Craib’s excellent “Cartographic Mexico, a history of state fixations and fugitive landscapes” (Duke University Press, 2004). This is a perceptive study of the relationships between history and geography in Mexico from the mid-19th century until about 1930. Craib emphasizes the significance of map-making in post-Independent Mexico as a means towards furthering nationalism and as a development tool. He also traces the changing motives of map-makers, focusing especially on the key area of Veracruz-Puebla which served as Mexico’s main gateway to Europe for centuries. One case study examines a mining area where the granting of water rights hinged on precisely where a particular river flowed, and which tributary was which. This proved to be a case where cartographic ‘proof’ was impossible to find, and a pragmatic solution was required. For a more complete explanation of some of Mexico’s place names, see “Mexico’s place names and their meanings” on MexConnect. Other Comments Off on The Aztecs knew their geography! Aztec place glyphs drawn in the 16th century Codex Mendoza suggest that the Aztecs had all the major branches of geography covered. The Aztecs clearly knew their geography!